Shocker: dense, compact cities tend to do better than others. 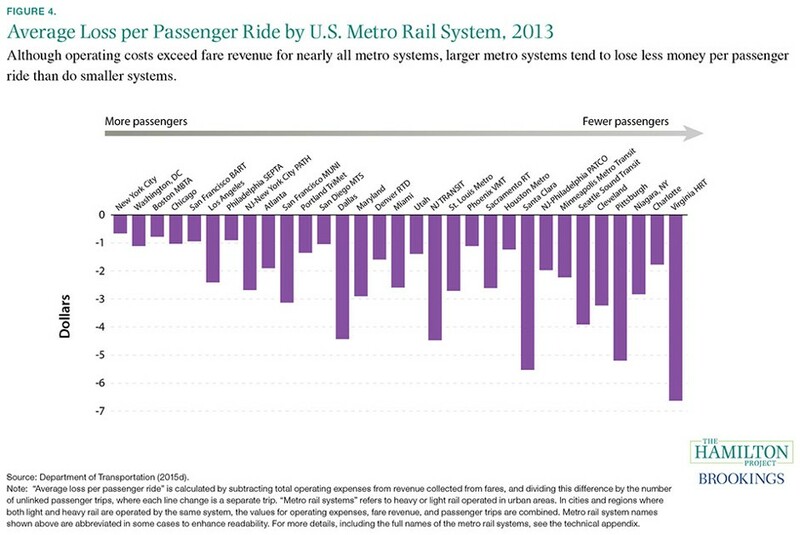 Alison Burke over at Brookings points us to the chart below, via the Hamilton Project, showing how much money major U.S. public transit systems lose per ride. The immediate if unsurprising takeaway is that every single metro rail system loses money. Only a handful of America’s 1,800-plus mass transit operations (metro trains as well as buses and other modes) generated more fare revenue in 2013 than they paid in costs, according to Hamilton. A number of big rail systems managed to lose just about a buck per trip, or slightly less. These include New York, D.C., Boston, Chicago, San Francisco’s BART, and Philadelphia. On the flipside of the scale are systems like Pittsburgh, Santa Clara, and Hampton Roads (Virginia), where the losses exceeded $5 a pop. Transit subsidies spark endless debate in cities, with locals often opposed to the idea of spending a great deal of public money to benefit a relatively small share of travelers. That’s a very narrow view of transit’s benefits. On a macro scale, agglomeration—or the ability to pack lots of people into a small place—can be worth billions of dollars in economic growth. At a micro level, even in small urban areas, good transit helps companies attract a strong employee pool. Beyond those benefits, it’s important to keep in mind that all transportation modes earn a subsidy to some degree. Drivers don’t pay enough in gas taxes to cover the cost of road maintenance and expansion, nor do they pay any fees at all for the massive annual social costs they impose through congestion, pollution, and safety. Squabbling over which mode gets more taxpayer money misses the larger point: both are essential for a high-functioning metro area, and both need help. It’s also critical to keep in mind that cities fully expect to lose money on public transportation. Every agency faces a trade-off: either cover a wide service area, which often means sending empty buses into remote areas, or focus on ridership and revenue, which means restricting service to high-density corridors near the city center. The subsidy backlash often arises with the flawed belief that you can have things both ways. The fact that some transit subsidies are inevitable doesn’t mean they can’t be limited. Transport scholar David Levinson has argued that a better funding model would treat public transit like a utility: fully regulated, but covering its costs. In a thoughtful City Journal piece a few years back, Josh Barro suggested that the whole discussion of transit funding must begin with smarter zoning that calls for taller buildings, mixed-use development, and no parking minimums. In some places it may also make sense to have higher base fares—especially along commuter rail lines that extend into affluent suburbs. As long as the price of driving also rose to match its full cost, transit ridership wouldn’t suffer, and service would likely improve. Cities could still discount fares for low-income users; as Seattle recently showed, new smart card technology makes it easier to put such equity programs in place. And when it’s time to expand a transit system into a new area, the real estate developers primed to benefit from the new service should pay much of its cost. That’s how they do things in Hong Kong, and it’s no coincidence the city’s MTR transit system makes an enormous annual profit. U.S. agencies will settle for being in the black first, but it’s always nice to have something to work toward. Should HOV access be given to all drivers during nonpeak hours? When my wife and I went shopping for a car, we weren’t looking just to buy four wheels and a drive shaft. We wanted the sticker. A green or white “clean air vehicle decal” issued by the DMV via the California Air Resources Board to owners of plug-in electric, all-electric, CNG and hydrogen cars gets you in the freeway carpool lane as a single occupant. That sticker gives you time — something no machine can do — to be with your family, fix dinner or kickback on the sofa with the cat. It grants people like me who stress out in bumper-to-bumper traffic peace of mind. In short, that sticker has more value than the car itself! The same thinking is behind Mike Gatto’s Assembly Bill 210. It would give single-occupant drivers access to carpool lanes during off-peak hours. Right now, carpool lane rules on most Southern California freeways are enforced 24/7. Southern California carpool lanes (High-Occupancy Vehicle or HOV lanes) must have two people, sometimes three, period, unlike in Northern California where HOV restrictions are in place only during peak hours. The Glendale-area assemblyman’s bill would roll out a pilot project for the 134/210 freeways from North Hollywood to Glendora/San Dimas (at the 57 Freeway). Along this stretch, all drivers could ride the HOV lanes during non-peak hours. If peak is from 6 a.m. to 10 a.m. and then 3 p.m. to 7 p.m., Gatto’s bill would allow access to all drivers from 10:01 a.m. until 2:59 p.m., then again from 7:01 p.m. until 5:59 a.m. The exact times would be set by Caltrans. His bill would also restripe lines separating the carpool lane from the general purpose lanes from double-yellow (uncrossable) to broken white, so vehicles can go in and out at any time. Gatto said too often, carpoolers jut into the left lane too quickly, causing accidents, or move suddenly across several lanes to their exit. From experience, I can attest he is right. The 210 Freeway eastbound’s HOV lane “exit” for the 605 Freeway comes too late. It is down-right dangerous crossing six lanes in a half-mile span. “Even Caltrans and the traffic people testified that restriping the lanes would produce a pretty neat by-product for safety. This can reduce fatalities,” Gatto said on Friday. The primary change allows non-ride sharers access to HOV lanes during off-peak times. The bill would help workers on nontraditional schedules, he said. Along this San Fernando Valley-San Gabriel Valley stretch of freeways many commuters work 11 a.m. to 7 p.m. and would benefit from riding carpool lanes — hardly used during off-peak hours. He’s heard from numerous employees from Disney, Dreamworks, Warner Brothers and other media outlets who ride these freeways during non-peak times and often sit in traffic when there’s an accident or road work, gazing at an open HOV lane. “For people who drive to say a government job in Norwalk, working 9 to 5, they can pool a ride. But a lot of people can’t do that, particularly if your job lasts from 10:15 a.m. to 1:42 a.m.,” he said. His bill also might be beneficial during game days or concerts at the Rose Bowl. Gatto is hitting on something car dealers don’t get: Time is the more precious commodity, not the car. “If you are getting someone off the freeway faster, that is the Holy Grail,” he said. A car going 0-60 in four seconds doesn’t do you squat in LA’s traffic. Use of an extra lane during off-peak hours, or a clean vehicle with sticker-access is what sells in gridlocked SoCal. I just checked. The CARB can issue 70,000 clean vehicle stickers (for plug-ins such as the Chevy Volt and all-electric cars such as BMW i3 or the Kia Soul EV). As of June 1, they were at 67,831. Either with stickers, or with Gatto’s latest bill (a previous version failed), the extra lane space makes for a sought-after commodity. Will the Legislature pass his bill and this time, will Gov. Jerry Brown sign it into law? Only if they value our most precious resource: time. When Virginia chooses transportation projects, should it narrowly look only at what makes cars move faster? Or should it consider how each project will transform the region, and pick the ones that do the most for residents, the economy, safety, and quality of life? A state board will soon tip the scales one way or the other. In 2013, the Virginia legislature passed a bill adding new funding for transportation. Some people wanted most (if not all) to go to widening the biggest highways and building new ones. They pushed a bill in 2014, called HB2, which would have forced money to go toward one goal above all others: reducing existing congestion on roadways. A state board is soon going to decide how to weigh reducing congestion against other factors like economic development, making jobs more accessible, or even safety. How much of a priority goes to congestion will affect the way Northern Virginia grows in coming decades. Consider two hypothetical cities. In Denseopolis, people live within 2 miles of work on average, but the roads are fairly clogged and drivers can only go about 20 miles per hour. However, it only takes an average of 6 minutes to get to work, which isn't bad. On the other hand, in Sprawlville, people live about 30 miles from work on average, but there are lots and lots of fast-moving freeways, so people can drive 60 mph. That means it takes 30 minutes to get to work. Which city is more congested? ... Denseopolis. But it's the people of Sprawlville who spend more time commuting, and thus have less time to be with their families and for recreation. This graph shows how focusing on congestion can point in the wrong direction: Chicago drivers waste more time in traffic than Charlotte drivers, but Charlotte drivers have worse commutes. Yet a congestion-only standard says that Chicago has the worse problem. Graphic from CEOs for Cities. People might say they want their roads to be uncongested, but really they mean they want their travel to be easier. Plus, even the kind of spending the road advocates want won't cut down on congestion for most people. That's because even though they have improved, traffic models still undercount the extent a newly faster road will just entice people to move somewhere that requires driving on it, adding traffic back in. That effect is called "induced demand." Induced demand is the name for what happens when increasing the supply of roadways lowers the time cost of driving, causing more people to drive, and obliterating any reductions in congestion. In 2004, a meta-analysis of dozens of previous studies found that "on average, a 10 percent increase in lane miles induces an immediate 4 percent increase in vehicle miles traveled, which climbs to 10 percent—the entire new capacity—in a few years." "Metro areas that invested heavily in road capacity expansion fared no better in easing congestion than metro areas that did not. Trends in congestion show that areas that exhibited greater growth in lane capacity spent roughly $22 billion more on road construction than those that didn't, yet ended up with slightly higher congestion costs per person, wasted fuel, and travel delay. ... The metro area with the highest estimated road building cost was Nashville, Tennessee with a price tag of $3,243 per family per year." Nobody likes congestion, and, despite appearances, I am not arguing here for more of it. Rather, I am asking that it be better understood by those who build and rebuild our communities, so that we can stop making stupid decisions that placate angry citizens while only hurting them in the long run. The computer models that predict congestion do not consider pedestrians, for instance, even though getting more people to walk has reduced traffic in places like the Rosslyn-Ballston corridor in Arlington. Theoretically, a much more sophisticated model could understand the congestion reducing effects of walkability and the congestion-increasing effects of induced demand, but today's models don't do this well enough. What happened with HB2, and why is this an issue now? Thanks to education and advocacy, the Virginia legislature amended HB2 to not focus solely on congestion. Instead, the statewide Commonwealth Transportation Board has to devise a scoring system which balances "congestion mitigation, economic development, accessibility, safety, environmental quality and land use, and transportation coordination." In 2015, the congestion crowd, led by Fairfax and Loudoun Rep. Jim LeMunyon (R), pushed another bill to force Northern Virginia specifically to prioritize congestion reduction "to the greatest extent possible and in the most rapid and cost-effective manner." The CTB will soon propose weights for these various factors, and that's where the fight is. VDOT Virginia Deputy Secretary of Transportation Nick Donohue proposed weights (page 17) that make congestion 35% of the score, accessibility (how much a project helps people reach jobs in under 45 minutes) 25%, and 10% to the others. (Outside Northern Virginia and Hampton Roads, where the law doesn't force congestion to the top, Donohue proposes 10-15% for congestion). Road booster groups like the Northern Virginia Transportation Alliance (no relation to the Northern Virginia Transportation Authority) don't like 35%. Even though that gets the biggest weight, NVTA wants it to get overwhelming weight—at least 60% if not 100% of the formula. NVTA is asking members to email Six-YearProgram@VDOT.Virginia.gov to ask to weight congestion more highly. If you live in Virginia, instead consider emailing them to support keeping the weight at 35% or, if possible, making it even less.